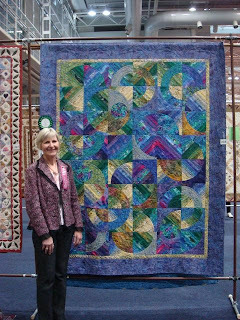 From October 9th to 13th there is an online quilt show showcasing quilts from all over the world. 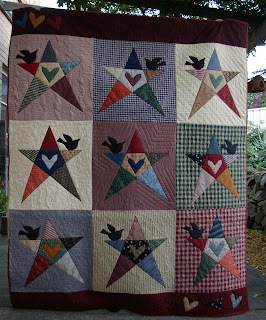 Click this link for many wonderful quilts and also to join in. 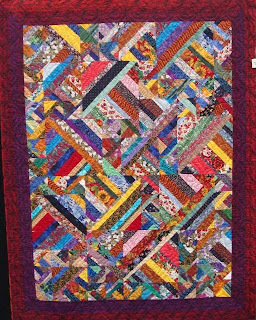 As this quilt show is a hanger's choice I have decided to showcase a quilt which I made many, many years ago. 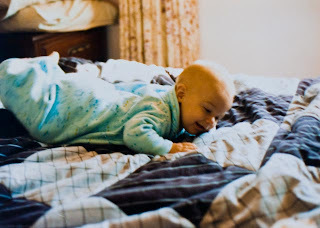 The face is that of my eldest son PJ when he was about 11 month's old. I have called it Going Home to suggest him being a long way away but with his thoughts and dreams still looking home. Funny that is how the situation has developed and he now studies in Paris and will be over there for many more years, but he does hope to come home permanently at some stage. 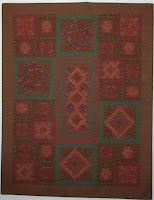 The quilt was made about 15 or 16 years ago. Wel l it has been a busy and very productive week. 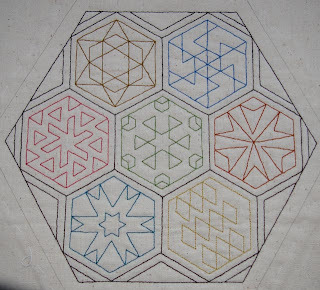 I have finished the new centre for my Turkish Delight quilt. 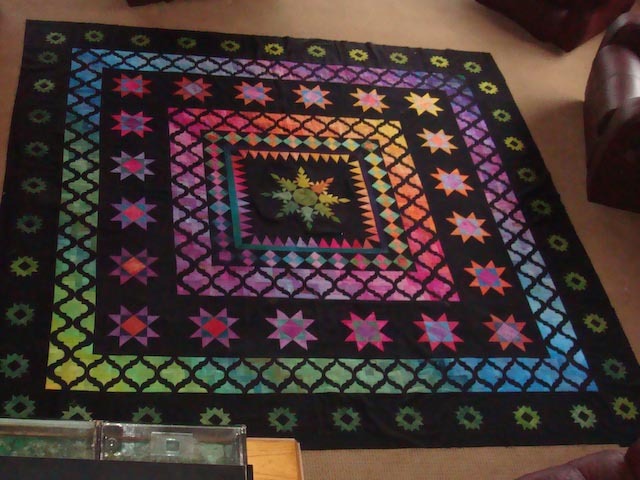 I am very happy with it and it just improves the quilt out of sight. I now need to add some borders as I want the orange arrow pointing towards the top corner rather than along that edge. I think it may even be finished in time for Xmas. This will definitely not be a persimmon tree affair. In this household if someone receives a gift that they consider a total dud it is know as a persimmon tree - in remembrance of such a tree which I once gave Paul, thinking he would like it but discovering he hated the fruit..such is life! Well I have finally finished attaching the outer border to Turkish Delight. Feeling very happy with how it went too. 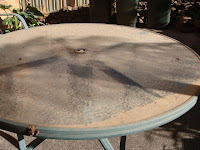 All that needs to be done now is to make a new centre and replace the vase then all will be done. 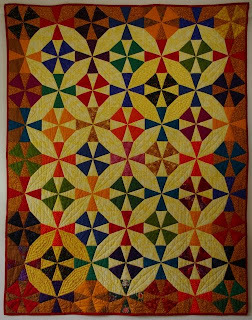 I haven't liked the vase for quite a while now and figured that I would simply throw something over it when the quilt was finished. Paul however had the bright idea that as it isn't quilted yet why not simply remove it and replace it with something I prefer. Clever boy huh? I have designed a feathered star which I hope to make in the upcoming week. 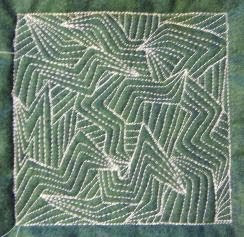 Making it in a variety of greens will help to unite the outer border back in with the rest of the quilt... I am also over the multicoloured sections too. Have booked it in with a longarmer, who unfortunately can't do it until early next year so even in that area I can't organise things as I would like. Well here you have the evidence. Yes we had a beauty of a dust storm here also. Unfortunately I never thought to photograph the inside of the house but it was almost as good? It had been rather warm early in the night of the storm and figured if I opened the windows it would allow the breeze to pass through the house and cool me down. Yes you guessed it. Dust isn't really that cooling but it does have a colour changing effect:) Spent all of Wednesday cleaning the house. the layer of red dust for some reason was not an appealing colour. Oh well I had wanted to do a thorough clean and I suppose there wasn't anything else which had actually prompted me to go from wanting to actually doing! Every cloud has a silver lining as they say. Don't you just love the windows. 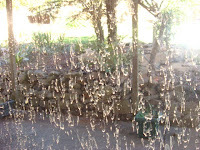 I think the worst of it was being stuck inside for several days waiting for the dust in the air to settle. Yes it is a late flaunt but there is a reason for it..I didn't realise it was Friday already. Just sat down to check the emails and surprise surprise there was Daphne's flaunt. My flaunt this week is related to last week's flaunt. 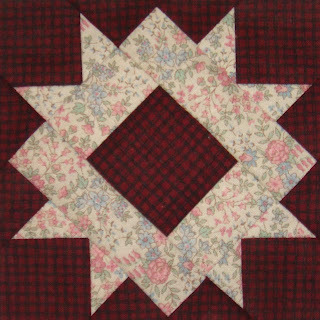 Rebecca from Patchwork and Quilting at Express Publications has just emailed me to ask if they could take my Confused Wells quilt to a few craft shows as the sample of a project from their upcoming magazine.... As you can well guess my prompt response was a definite yes! So anyone going to Brisbane or Adelaide in the next month or so will be able to check it out in 'real life'. I was also going to flaunt the 59 charity blocks I made for the NSW guild get away last weekend except they were all 1/4in too small. 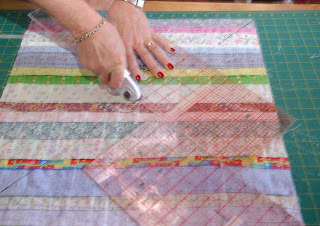 Note to self - when using someone else's machine be sure to check their 1/4in foot... oh well at least they only need to cut down a few of the other people's blocks to have enough for three quilts! Well two flaunts really. 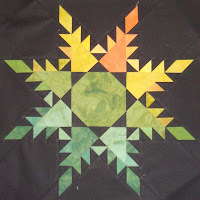 Tomorrow is the first day of my online class at Quilt Campus. Scroll down until you get to Confused Wells and that is my class. It is my version of Hidden Wells but without the restrictions of strips being a fixed width and blocks being same size and in fact any other restriction. 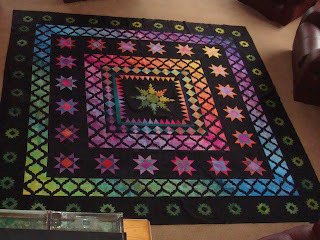 I really like the quilt and in real life it is a lot brighter than this photo shows. 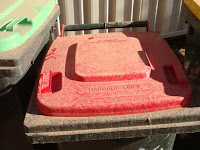 I have taught it a few times and all of the students have had success and it is perfect for clearing out the rubbish which we all seem to accumulate in our stash over time. 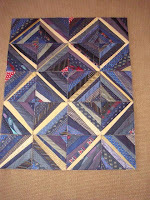 My second flaunt is this tie quilt. 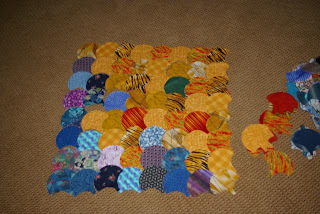 I would love to say that I have finished making all of the blocks but when I lay it out it just screamed that it was too short. 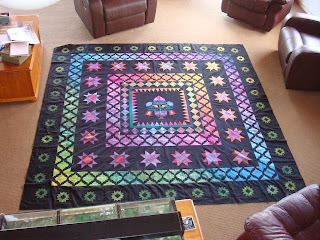 So in a few weeks you will see a similar flaunt, I hope, when I finish another four blocks... fingers crossed. I know this is an old one but it is definitely a good one... parenting tips for a single parent trying to bring up twins. The boys, Carmichael and Shane, both are gorgeous and play their roles superbly. Check it out well worth the five minutes and I am sure you will laugh. I really do need to get a time manager. I have spent almost an hour sitting here surfing and haven't had a chance to start all those horrid tasks one must do. However I do have a very good reason. I have found some top giveaways which, if you have a few minutes, or hours to spare are worth checking out. 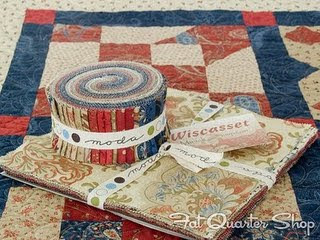 Art Gallery Fabrics is giving you the chance to win a bundle of FQs or and this is what I would love most a bag of scraps... 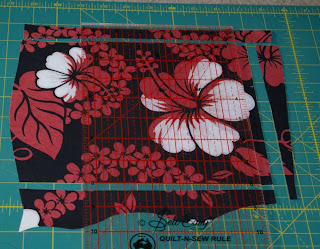 I really do need to move on from scraps...but not just yet. Sorry but I just went give you links to the other giveaways but my browser died and I have lost those. As I said I need a time manager and so must leave now... but check out the above link. Well what do you think of this for a brag? 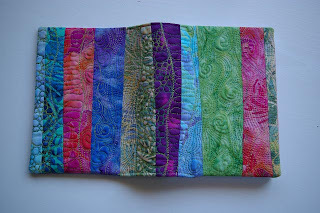 I am now an online designer with Christine Abela's ecraftpatterns. Check it out. I am there. Yes I know it is bragging but I can't believe it... especially the part where I actually managed to get organised enough to get my design instructions converted correctly to pdf. Yes I know everyone says it is easy and it probably will be next time.. especially if I don't start out with a table format, but that is another story. 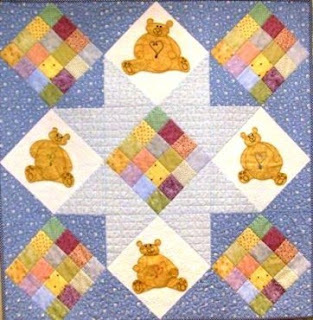 My first pattern is one which I drew up for a friend of mine who wanted to begin teaching patchwork. 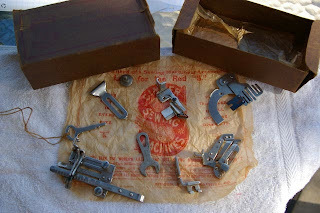 It was perfect for a beginning teacher and also for a beginning patchworker. Again you can see Paul's watermarking .. for those who asked for a tutorial he will provide this once he can remember how he does it. He is still at the "I think this is what I did last time" stage.. but getting faster. 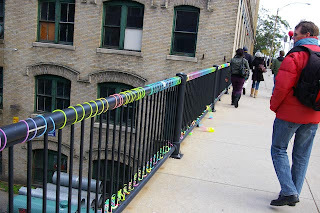 Found a fantastic blog today, 365 Days of Free Motion. Everyday Leah is uploading a new free motion design with an accompanying video. Check it out and I would even recommend you bookmarking it. The design beside is called Lightning Bolt and is from day 27. Well I can't believe how busy I have been. I have been trying to get organised for this weekend's retreat plus write instructions for a few patterns and in the midst of this we had a visit to Brisbane. Took some lovely photos while travelling and figured that I would upload some. The collage above is a collection of photos of homes which I lived in as a child. Isn't it amazing how our memories remember things. 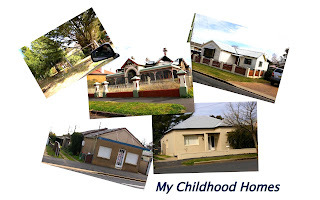 When I lived in these homes they were beautiful but the years have not done them any favours. We never lived in the middle house but it is one I have always loved. When I was young it was to me a palace with two huge lion statues guarding the entrance. I have always wanted a majestic entrance and I think it is because of this house. Unfortunately arsonists visited it a while ago and there is little left of my dream. My happiest home was the one on the lower right and it still looks well loved. Well here it is Friday again. I have been unbelievably busy for most of the past fortnight but the last two days have been great. 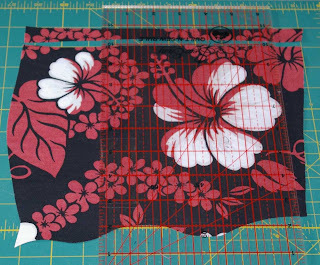 I am now working on the next border for the quilt top I flaunted a fortnight ago and have decided to do this block. 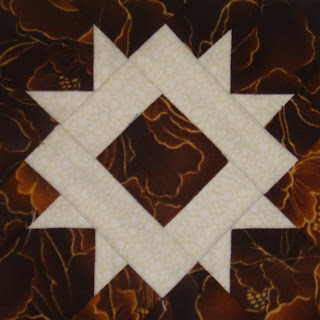 Initially I wanted to make 8in blocks but after talking with friends have changed my mind and will now make smaller blocks and ... if I can find some more hand dyes in enough colours will do a final border of sawteeth after this one. 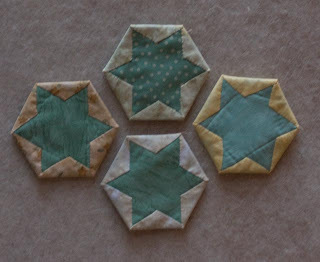 Last night I decided that foundation piecing was the way to go and so drew them up and after only two more samples I have managed to work out what sizes to cut the fabric and the order of piecing to achieve what I want. I am planning on making all of the backgrounds in black and the star/whatever in a variety of greens. Now who could refuse an opportunity to win this gorgeous prize. Jane, on her blog, has found some great giveaways. Click on this link for the chance to win this Charming Jelly Cake... and it isn't even fattening. Or you can simply click on the photo and it will take you there also. Go and check it out and leave a comment for your chance.... and if you win and can't decide what to do with the prize I am more than willing to help you out... what are friends for? Well I'm not sure if this promotion is still running but if it is then you have the opportunity to win a free pair of whooga ugg boots. Yes I know it is warming up in Australia but there are many countries where a white Xmas is approaching rather than 0ur traditional scorchers. Anyway it is worth a try if you like uggies. click on the little picture and it should take you to the site where you can register for the competition if you are interested. Ok now if you would like to win a $100 gift voucher click on this link to the Fat Quarter Shop blog and follow their directions. 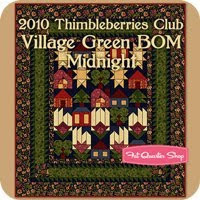 You will have to decide which colourway you prefer for the Village Green BOM but other than that it is easy. Oh and good luck. If you click on the picture you can even order the kit if you would like it but it is not due until December sometime... perhaps a gift for yourself or someone special. PS don't you love it when you can schedule posts to show on the correct days. Well here it is. I have finally attached the next border onto Turkish Delight. 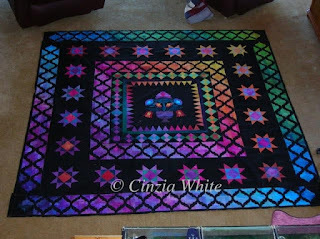 This quilt was started many,many years ago when I decided I wanted to learn how to applique. At that stage I was also into dyeing and so all of the fabric, apart from the vase and the black are my own hand dyed fabrics. The lattice design is also my own as the original class had a swag which really wasn't me. 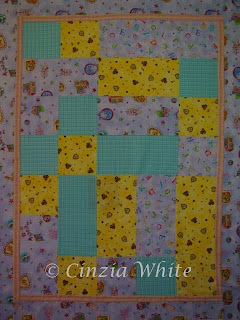 I now need to add one more border as it isn't a really useable size, too narrow for queen and too long for anyother size. 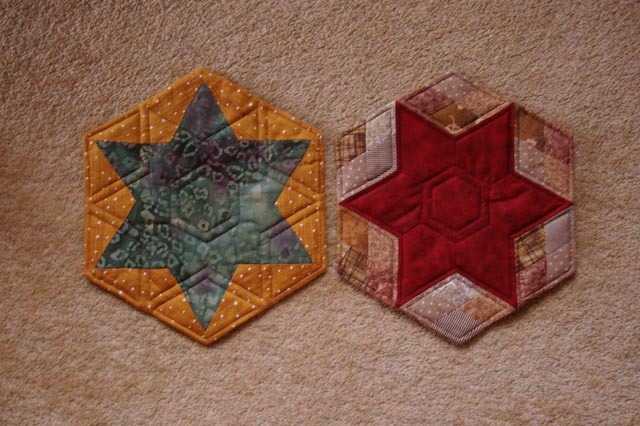 I will add another border of floating stars which will hopefully make it king size and then finished. OH and what do you think of Paul's watermarking skills. He is trying to learn a few more skills and so practises when I ask him for something. Surfing again I have found yet another challenge for all of you creative people out there. Do you have any wizz bang idea for an Amy Butler name tag? If yes then check out here as you have the opportunity to win some gorgeous Amy Butler patterns as well as other surprises. If interested then check it out. 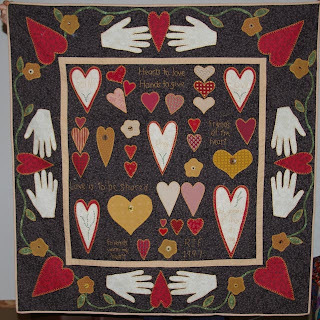 I would love to say that I made this quilt but truth be told I selected my fabrics and copied a few of the hearts onto the vliesofix about three, or more, years ago and that is as far as I went. 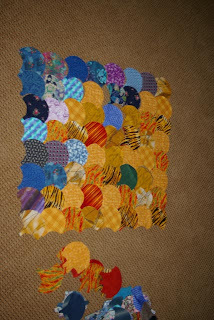 yes this quilt was destined to be another WISP, Work in SLOW progress. My friend Rhonda had made it, in 1997 if you read the label and I had admired it for many years. Unfortunately I had never managed to really make a start on it which as it turns out was quite fortunate. You see Rhonda has moved from a huge four bedroom country home to a modern two bedroom villa. With the change of abode also came a drastic culling of possessions and a change of style. This meant that the quilt no longer fitted in. Yahoo!!! It now resides in my place! Aren't I a lucky bunny? I know you have all seen those wind chimes made from old cutlery and loved them. Well here is another great use for unwanted cutlery, albeit a hell of a lot more work. 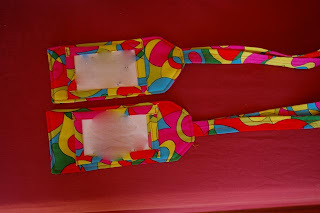 Kristie is making these for sale but is also offering you a chance to win one. So if you are interested pop on over and leave a comment. 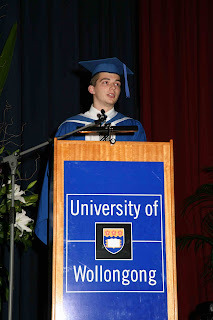 Well here he is.. Richard delivering the valedictory speech at his graduation last week. Well today I started to upload the photos from our last holiday. 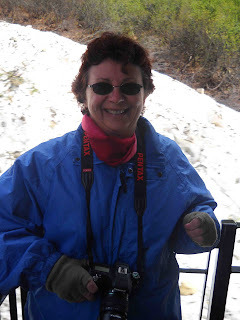 Here is a picture of me on the train from Skagway to Ketchiken. You see the snow in the background that is the height above the ground level .. it isn't going up a hill... the background is actually sloping down away from the train. It was absolutely amazing. 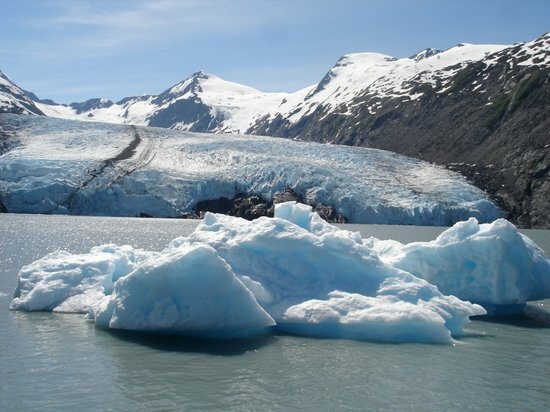 This is the end of the season so you can just imagine what it must have been like at the height of winter. Actually in winter the train can't get through unless it has a plough go through first to clear the lines. The lines had been cleared a few weeks before to allow the passenger trains through for the holiday season. Well the winners have been announced and there were some real beauties among them, including my dear friend Margaret. This was her first entry into the show and she won the ribbon for fourth in 'first time entrants'. 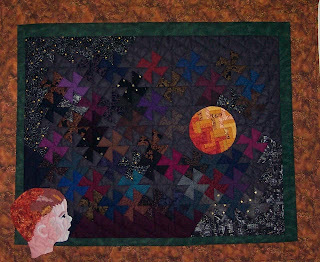 What do you think of her quilt... not bad for only having been at it four years.. no not the quilt for four years... quilting four years! Yes I realise I am running behind but the lucky winners have finally been chosen. Thanks to everyone who joined the party and entered this competition. 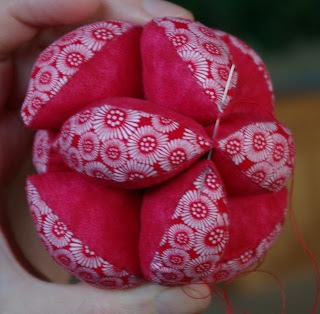 The lucky winner of the oriental pin cushion is Mary in Melbourne - love pincushions . Please count me in. Could you both please contact me at opposite(dot)like(dot)conscious79@gmail(dot)com so that I can organise sending your pin cushions to you. Well our holiday is almost over... and there are still no snaps up on the blog. But just wait until I get a chance. Our final leg home was postponed when China Air cancelled our last flight and so what should have been a three hour stop over has been stretched to 36 hours. Lucky we didn't have further connecting flights like some of the others. We have been put up in a hotel in Taipei and today were taken on a five hour tour of the city... fantastic. Will upload photos sometime next week. Yes we do have some photos - I took almost 2000 and Paul took about 800! Paul suggested we invite over anyone who we don't want to revisit and show them ALL of our snaps... how horrific. I can still remember being forced to watch 'hjoliday' snaps of some friends of the family.... wll one way to clear out unwanted visitors - or at least guarantee they won't come back. Looking forward to being home again. As wonderful as other places are they don't match home. While talking to Richard this morning on google chat he nonchalantly mentioned that there was an article about him in the local paper. Me being the mum of course immediately went out and bought a copy of the paper. Paul being more the talkative person continued chatting to him and discovered that it could be viewed online. Mind you one advantage I had over Paul was that I discovered that Richard was also on the front page! Isn't he cute! His article was even popular enough that he reached number 3 in the most popular stories for the day.... and I have the print out to prove it. Yes I am very proud of him and I agree with the person who left the comment on the site that he was handsome! Placing the two rulers side by side, slide them so that they pass through the corner points of the square as shown. 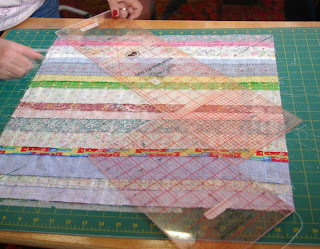 With your right hand hold the smaller ruler in place as you slide the long ruler beside it until it passes the upper corner. 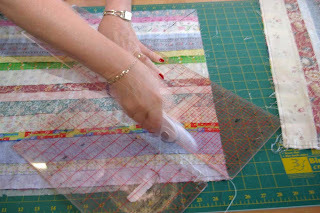 Discard the smaller right hand ruler and complete the diagonal cut through the top corner. Well the winners have been announced for Paducah and boy are there some beauties. You could spend an eternity looking over some of those beauties. Mariya Waters won with her beautiful Renaissance Revival which has to be seen in real life to be believed. The photos don't do justice to it. 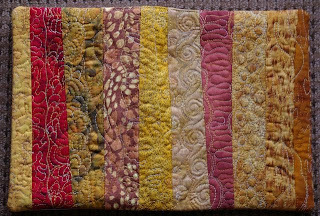 Also heard that Nicole Bridges and Lisa Walton won third prize for wall quilts which is also great. 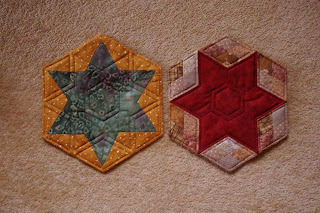 On a sad note... well for people who are not into applique.. it again appears as though there is no chance of winning a major prize at Paducah if you prefer piecing rather than applique... ahhh such is life! Well I was the first!!! 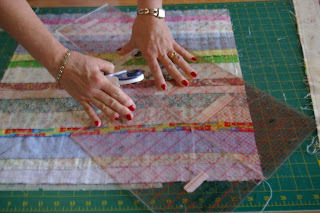 First one to sign up to follow blog for next year's Scquilter's retreat. It will be at Bathurst which is only next door to Orange, where I grew up. First opportunity in years for me to go back and check up a friend... I would say or two but there you have it... I only have one friend. Well only one left in Orange anyhow and it will be great to see him again. I could warn him but then again he might leave. Hmmm might this suggest something about my circle of 'friends'?